Summer is coming and we’re starting to think about life outside the home and in the garden. When we get sunshine, Cork can be one of the most beautiful spots in the world to spend quality time outdoors with friends and family. And what better way to take advantage of it than in a pool? At Douglas Forest & Garden, we have the entire range of Exit Swimming Pools available, and it’s about this time of year when people start asking us about our range of Exit Swimming Pools. In particular their largest model, the Exit Stone. Here’s a rundown of what you get with the Exit Stone Swimming Pool and why we can comfortably recommend it – even in our Cork climate. The Stone Exit Swimming Pool is Exit’s largest pool. Included with the Stone is the Exit ‘Pool Dome’ and filter pump, and, of course, a ladder. The Stone is perfect for up to 9 people to enjoy over the summer. But unlike other outdoor pools, Exit comes with a ‘Dome’ — making it perfect for Ireland. The Stone Swimming Pool comes with a ‘Dome’, a hood which keeps your pool clean, and crucially for Cork, helps heat the water. 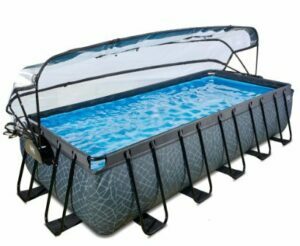 This allows you to enjoy your swimming pool throughout the summer without having to worry about the weather. This tall, transparent hood has three windows and a door, so you can adjust the heat. It straps around the outside of the pool and stays there quite happily – even with a breeze. The Dome makes the pool perfect for our Irish weather. It keeps the breeze and bugs away and, like a greenhouse, keeps your pool warm. The Dome is opened and closed easily with a gas-powered hinge mechanism, but you can also leave the Dome open just by the pool ladder so you can get in and out easily without messing about. The dome is very spacious – not too low – so you and your 8 friends can throw a ball around and enjoy yourselves. The Stone Exit Swimming Pool (named for the ‘stone-like’ effect on the outside) isn’t going anywhere. It’s very strong and durable, with a frame composed of thick, black steel (50 mm diameter). The steel is galvanised and powder coated to protect from rust. The walls are composed of 3 durable layers of PVC and polyester. They’re strong and sturdy and they take a fair beating. But just in case the pool eventually succumbs to wear and tear, Exit provides a liner repair kit. Also included is a filter pump, which keeps the water fresh and prevents pollution. This is easily mounted on the pool (and can be replaced easily using a filter cartridge – which is included).